SCUBA divining and snorkeling in the Philippines is quickly gaining popularity around the world with more and more resorts being built that are catering to vacationers that enjoy underwater safaris. 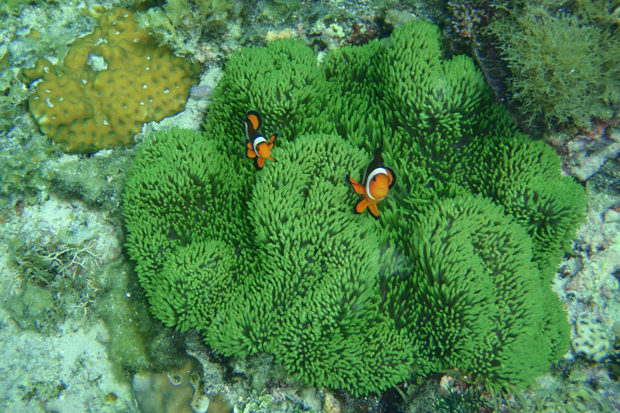 The Philippines is know around the world for its diverse coral reefs and fish species. The Philippines is a great value for vacationers and is well know getaway for many Europeans and is starting to catch on with many North Americans. Most Filipinos speak English as a second language. The Philippines is comprised of 7,107 islands, and is the 12th most populated county in the world. A lot of the fish you will see on a Philippine reef will look familiar to you as many of them are commonly available in the aquarium fish trade, and are often displayed in public aquariums. I recently completed my second trip to the Philippines in October 2009, visiting four islands I did not get to see on my first. To get to the Philippines I flew from Sacramento, California via Hawaiian Airlines to Honolulu, Hawaii, and from Honolulu to Manila, Philippines. On this most recent trip, I flew from the Manila Domestic Airport via Philippine Airlines to Tagbilaran City on the island of Bohol. At Tagbilaran City Airport I was met by a van transport driver from the Alona Tropical Beach Resort from the island of Panglao which is accessible from Bohol via a bridge. After my stay in Panglao I took a Oceanjet passenger ferry from Tagbilaran City to Dumaguete, Negros. I stayed in Tanjay at Melania's Garden Resort for three nights and had a opportunity to visit commercial fish ponds for raising Tilapia, Milkfish, and Groupers for the fish markets. I then took a Delta Fast Ferry to the island of Siquijor. At Siquijor I was met by a van transport driver from Coco Grove Beach Resort. After my stay on Siquijor, I traveled via ferry back to Dumaguete and flew back to Manila via Philippine Airlines. Flew from Manila back to Honolulu via Hawaiian Airlines, went through immigration and customs in Honolulu and then flew back to Sacramento. The island of Bohol is known for the Chocolate Hills and one of the smallest primates in the world, the Tarsier. Other interest on the island include a Albuquerque Zoo animal sanctuary known for the largest snake (python) in captivity (Prony), Simply Butterflies Conservation Center, and Hinagdanan cave. I took a dive boat from Alona Tropical Beach Resort to Balicasag Island, about half of the people on the boat snorkeled. Diving off of Balicasag Island includes walls as well as shallow reefs. You can see sea turtles with Ramoras hitching a ride, barracuda, and if your lucky you may spot a large Humphead Wrasse (Cheilinus undulatus). Large shoals of Anthias can be found feeding on plankton along the reef walls. The reefs are full of soft, leather, small polyp stony (SPS), and large polyp stony (LPS) corals. Snorkeling off of the beach at Alona Tropical Beach Resort was not the best I have experienced in the Philippines. To get to large areas of coral required a lengthy swim through Sargassum seaweed that was typically 2 to 5 feet (60 to 150 cm) tall. Average water temperature in October was around 82° f (28° c). There was a nice Orange Bubble Anemone (a.k.a. Rose Bubble), Entacmaea quadricolor, hosting a Tomato Clownfish (Amphiprion frenatus) in about 5 feet (150 cm) of water. While there was lots of damselfish, clownfish, and wrasses, there were very few fish exceeding 4 inches (10 cm) do to over fishing. Photos off of Panglao Island, Philippines. Siquijor Island was a pleasant surprise. The Coco Grove Beach Resort has a marine sanctuary right off the beach were fishing and shell collecting are not allowed. This site turned out to be the best snorkeling I have experienced to date in the Philippines. Large shoals of Parrotfish, and Tangs can be found. Regal Angelfish (Pygoplites diacanthus), Majestic Angelfish (Euxiphipops navarchus), Titan Triggers (Balistoides viridescens), and many species of butterflyfish can be seen. I saw many species of fish at this site that I have not seen anywhere else I have dove or snorkeled in the Philippines. Photos off of Siquijor Island, Philippines. Negros Island offers an excellent diving and snorkeling opportunity. The Atlantis Dive Resort (Dumaguete) in Dauin caters to the SCUBA diving vacationers. From Atlantis you are only 45 minute boat ride away from famous dive locations around Apo Island. Apo offers the best drift diving I have ever experienced. Nudibranchs are common, Firefish Goby (Nemateleotris magnifica), Emperor Angelfish (Pomacanthus imperator) are often spotted around the coral. Right off of the resort beach you can see Mandarin Dragonetes/Gobies (Synchiropus splendidus) spawning at dusk. Snorkeling off of the resort is very good. Cuttlefish, batfish, Blue Spotted Stingray (Taeniura lymma), and many species of Clownfish and Anemones. Many fantastic dive sites are only a couple minutes boat ride from the resort. The Atlantis Dive Resort restaurant was very enjoyable, I especially enjoyed the German food. Every dive and snorkel location in the Philippines I have been to offered a unique experience. You will always see something at a location you have not seen elsewhere. The diversity of species and eco-systems always makes each site uniquely enjoyable. Coral looks to be in good health in all of the places I have dove, or snorkeled at in the Philippines. Beach resorts normally have PADI dive facilities with certified instructors. Many SCUBA diving students get their required classroom, pool classes, and tests out of the way at home and get their open water certification dives done with an instructor in the warm waters of the Philippines. Traveling in the Philippines in October (off season) was very enjoyable. The resorts were not crowded and very relaxing. The Filipino people are very accommodating, and private island tours very affordable. For Americans, you will find the Filipino pace much slower than what you are used to in the States. Resort restaurants normally offer European, American, and Filipino cuisine. If you like fresh seafood, you will really love the Philippines. "The Aquarium of the World"